Daily from March to Mid-November or Tuesdays, Saturdays and Sundays from Mid-November to February. Outside of the busy peak season. We are comparing Rome Super Saver: Best of Rome Walking Tour Prices from leading ticket suppliers and Try to find you Cheap tickets prices on the market. The Supersaver Colosseum and Ancient Rome tour with Best of Rome walking tour is perfect for those with limited time in the city or for first-time visitors. During this 8-hour tour you'll get to see the best that Central Rome has to offer. Combine Renaissance and baroque art with ancient history and modern culture in a well organised day tour. This day trip is split into two parts, first is a visit Rome's Colosseum. With skip the line entry you'll breeze past the queues and follow your guide into the Roman Empire's largest building. Hear the facts of the Colosseums construction and the bloodcurdling tales of the battles which took place in the arena. You'll then be led to Palatine Hill and the ruined temple known as the Roman Forum. The second half of this tour brings you back to modern day Rome, exploring its' pretty piazzas, baroque architecture and Renaissance sculptures. See the majestic church of Santa Maria del Popolo and drink from the Trevi Fountain. This tour provides a comprehensive introduction to the city. Ideal for anyone interested in seeing the highlights of Rome in a short space of time. Your Experience With Rome Super Saver: Best of Rome Walking Tour? Combine a visit to the Colosseum with a tour of Rome's top attractions in a convenient one-day sightseeing experience. Save time and money with a combo skip the line entrance ticket to the Colosseum, Palatine Hill and Roman Forum. Stroll around Central Rome with a knowledgeable local guide, visiting famous sites such as Piazza Navona, Trevi Fountain and the Spanish Steps. What Rome Super Saver: Best of Rome Walking Tour Includes? 8 Hour guided walking tour. Priority fast track entrance to the Colosseum, Palatine Hill and Roman Forum. Complementary Gelato (summer) or hot beverage (winter). Rome Colosseum – Best of Rome Walking Tour. These tours can also be booked separately but for the best price you should purchase this combo ticket. Travelers Reviews about Rome Super Saver: Best of Rome Walking Tour? This combined full-day tour is very highly recommended. On Viator this tour has gained over 1,500 reviews from happy customers who have given it a 5 out of 5-star rating. Travellers say that this is a very interesting tour led by friendly archaeologist guides. 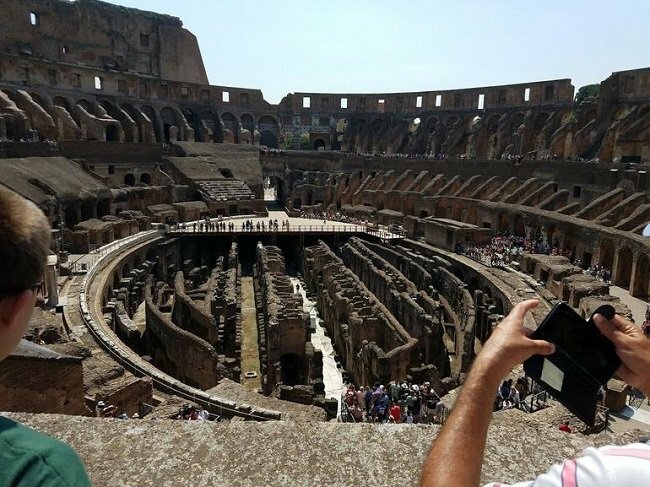 Comments also say that skip the line entry to the Colosseum is very useful. Bring either electronic or paper ticket. Tickets are full refundable up to 7 days prior to departure, fees apply for cancellations made 3-6 days in advance. Large bags/suitcases must be left outside the Colosseum and Roman Forum. Meeting Point: by the Colosseum Metro Station, Central Rome.